What are Flea Carpet Powders? Fleas… Even the very sound of the word sounds like a contagious disease and why not? The name has become synonymous with doom and gloom. Fleas affect pet and human health and constitute a nuisance around the house too. Imagine coming home to rest and then finding a horde of fleas everywhere the light touches, ew, right? Anyway, there are many ways to send fleas packing from your home. Knowing that these fleas get into your house by attaching themselves to your pets (dogs and cats alike) when they go outside to play, it is important that you treat your pets with medication regularly as prescribed by a vet. This medication, however, will not solve the infestation problem that’s already in your home and that’s why you’re going to need something else to join forces with the pills. You’re going to need the best flea carpet powders you can possibly find and our guide is here to help you make that decision. How Do Flea Carpet Powders Work? Flea powders work following a very simple process. Now, when fleas are brought into your home by your pets, they go and make their homes inside your carpet and furniture. It is in these places that they live as well as breed. If you remember elementary biology, you’d recall that when insects lay their eggs, these eggs mature into small, worm-like creatures called larvae before they metamorphose into full-fledged adult insects. So, here’s what the flea powders do. By the time the egg has reached larva stage, it feeds on the powder and dies. So, it never gets to the adult stage. But how about the ones that are adults already? Flea powders kill them as well. Different powders have different ranges of time within which they kill fleas and their larvae. Some are really rapid, while others might take between 4 and 6 days. 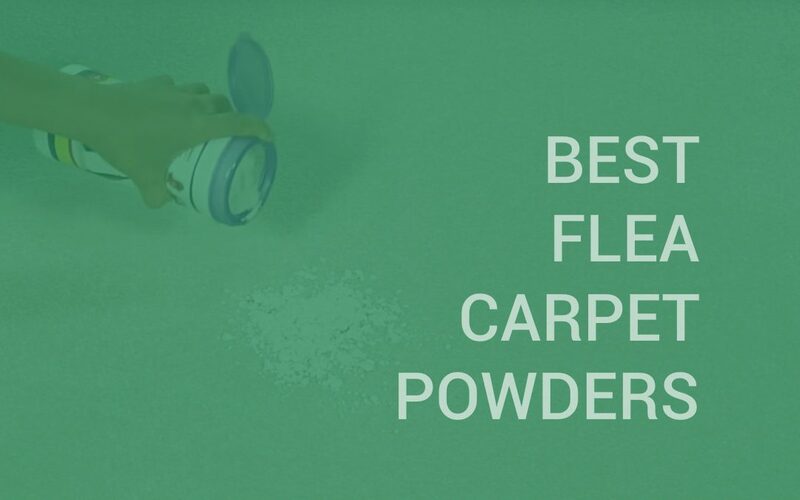 How Reliable are Flea Carpet Powders? One thing that seems to be working in the favor of flea powders and makes them a more appealing option than other spot-on products is the fact that they are mostly affordable. Also, they are pretty multifunctional when compared to other similar products. For instance, aside from their uses on carpets, they can also be used on bedding, furniture, out in the yard and even on your pets themselves. However, how reliable are they? From research, it would appear that although flea powders are effective in flea treatment in the home, they are much more suited to that purpose than in direct application on pets. Flea powders should, therefore, not be considered an alternative to flea drops, tablets or collars, but rather, as a reinforcement. For a most effective flea treatment for your house, after spreading your flea carpet powder, please ensure that you do not vacuum until the powder has settled in for at least an hour. But if the infestation is really bad, like an apocalypse of some sort, then you might have to leave the powder in for up to 24 hours before vacuuming. Bear in mind that in combating a flea infestation, you will have to vacuum the areas you’ve applied the powder for fleas (making more frequent vacuuming a necessity). Yeah, welcome to the struggle. Pets pick fleas from the outdoor mostly and if your pet is one to spend most of his waking moments in the yard playing, then it might be a good idea to get a diatomaceous earth fleas powder. Diatomaceous earth fleas powders are quite inexpensive and will work wonders in your yard by effectively eliminating fleas and making the yard flea-free for your precious pet. It is relatively safe and poses low risks of toxicity. In essence, flea powders do work but maybe not when applied directly to your pets. If you want a total flea annihilation, then combine flea powders with regular flea treatment and preventatives for your pets and you’ll be flea-free in no time. What Do Flea Carpet Powders Contain? Pyrethrins: These are naturally-occurring extracts found in the flowers of chrysanthemum plants which grow in Japan, Europe, the Middle East, and Kenya. Pyrethrins are of six different types which include: Pyrethrin I and II, cinevin I and II and Jasmin I and II. Pyrethrins work by affecting the nervous system of the insects and consequently causing repeated firing of the nerves which leads to the outflow of sodium from the cells and, ultimately, death. They are effective against fleas as well as ticks, lice, Cheyletiella mites and mosquitoes. Because pyrethrins are easily degraded by stomach acids, toxicity in pets following ingestion is very low. And in those rare cases, symptoms (which include salivating, tremors, nausea, and seizure) disappear after 24 hours. Pyrethroids: These are synthetic pyrethrins, meaning they are made in the lab instead of naturally. 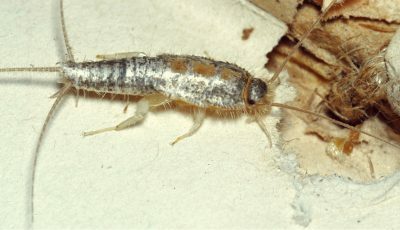 Although slower in action, pyrethroids give a longer effect than their natural cousins. They cater to the same range of insects as pyrethrins but present a higher toxicity, even though their toxicity is still low. This is because it’s a bit more difficult for them to be broken down in the guts of pets than pyrethrins. Should your pet present symptoms (which is same as for pyrethrin toxicity), please see your vet immediately. Insect Growth Regulators and Development Inhibitors: These include methoprene, fenoxycarb, pyriproxyfen, and inhibitors such as lufenuron, and diflubenzuron. Insect growth regulators basically work against the immature forms of the fleas and keep them from developing into adults. When the larvae fail to molt, they shrivel up and die. Development inhibitors, on the other hand, hinder the process of synthesizing chitin. Chitin is what forms the cuticle of the flea and if this isn’t formed the adult flea cannot exist. Because these ingredients do not kill, they are best used together with an adulticide. They may prevent a re-infestation but if you already have an infestation problem at hand, then they might not be your best bet. However, though, they are super safe to use. Diatomaceous Earth: Flea powders containing diatomaceous earth are very effective in their function, however, diatomaceous earth does not come without its risks. And the risk is that the risks are not well-known which means that many will use this without taking precautions and might run into problems not knowing that it has the potential to be hazardous. When getting a diatomaceous earth flea powder, ensure that you read the label carefully. It should have an EPA registration number and should tell whether or not dust masks are needed for the application, including other relevant information about the dangers of toxicity with exposure. Generally, diatomaceous earth is considered safe at a concentration of 2% but with the prolonged exposure that flea control will demand, you might need to take steps to protect you and yours by reading the label and following instructions; ensuring your pets and kids are away while you apply the product, using a dust mask while applying, and applying only in areas that aren’t easily accessible to people and pets. Fleabusters has, for over 20 years, been saving homes and carpets with its array of products of which the Fleabusters Rx for Fleas is a prime example. Registered with the Federal Environment Protection Agency as well as other state agencies, its products have been approved to be both effective and safe for use in all states across the US. 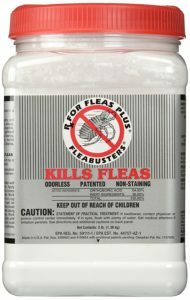 If you’re tired of fleas calling the shots in your home, then its time you got the Fleabusters Rx for Fleas. We are confident about putting this particular flea carpet powder on our list because its mechanism is not only effective, it is also very genius. A little bit of a science lesson now. Fleas are very sensitive to extreme pH values. So, naturally, if the pH of a certain place is, say, acidic or alkaline, the fleas will sense it and consequently avoid. 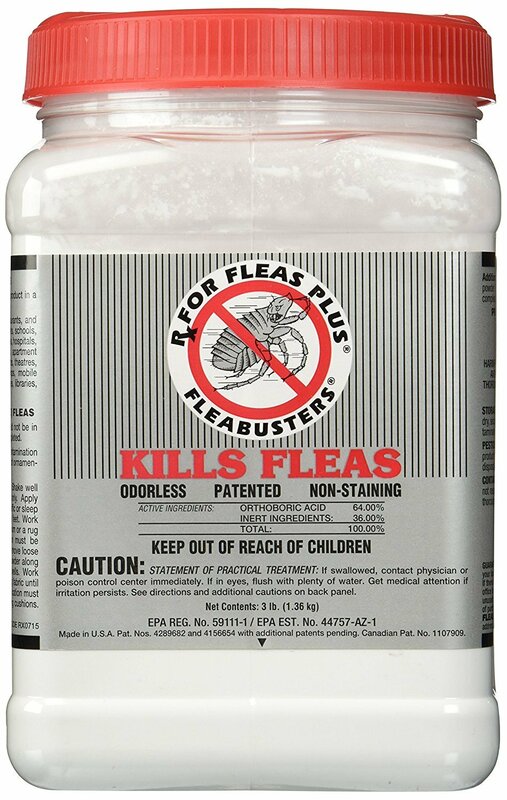 But here’s what makes Fleabusters Rx for Fleas stand out, it comes with a neutral pH of 7. Because fleas cannot sense this neutral pH, they unsuspectingly walk through and of course, end up dead. The larvae are not spared either when they wiggle past that area, the powder attaches to them and dehydrates them, thereby killing them. You know what’s even more amazing about this flea powder? Less is actually more! You don’t need to pour a very large amount for it to work. Sprinkling just a few crystals is enough to completely take down all the fleas, including their long-distance cousins, like roaches, in your carpet. This powder is odorless, and your children and pets can even come in immediately after you apply it. It won’t cause them any harm. When considering flea treatment for homes, you definitely want something that comes with a long-lasting effect even when applied once. And that’s why you should consider getting the Fleabusters Rx for Fleas. With one application, the powder clings to carpet fibers such that even when vacuuming, the powder does not get removed, thereby enabling it to last. In fact, the manufacturers of this product are so confident that they have an unconditional money back guarantee. Should this flea carpet powder fail to impress you or last an entire year, you can return the product for a full refund or a replacement respectively. In very simple terms, Hartz is obsessed with your pet or why else will they put in over 90 years of hard work and dedicated service into ensuring that your pet gets all that it needs to be happy and healthy? By consistently providing innovative and affordable products, as well as knowledge and support, this brand has successfully created and deepened bonds between pets and their families for decades unending. What started in 1926 as 5000 singing canaries in the hands of Max Stern as payment for a debt owed him by a friend has, today, blossomed into an established brand catering to all kinds of pets from goldfish to cats to dogs. Owning over 1500 products with more on the way, Hartz continues to teem with newer and better ideas for engaging pets and keeping them in health with quality and creative products that range from ergonometric leashes to advanced flea and tick protection, to imaginative toys. If you’re looking for a super effective flea treatment for houses, then the Hartz Ultraguard Flea and Tick Control Carpet Powder is definitely something we will recommend for good reasons. First of all, it is rapid. It kills fleas in carpets and rugs in a very short time. And not just fleas alone, this powder is equally potent against ticks too. When applied, this flea carpet powder doesn’t just kill adult fleas, it also destroys their eggs and larvae and we know this is good news because it means longer and more permanent protection for us and ours. It totally eliminates any chance of the eggs and larvae metamorphosing into adult fleas that can cause trouble again in future. In essence, it’s a total eradication. And you know what? This eradication continues for 30 days non-stop! Just one application! And it gets better too. In addition to the continued eradication of fleas and ticks for 30 days non-stop, this flea powder will help to prevent a re-infestation for up to one whole year. We know how most flea carpet powders can stink but thankfully, this one only comes with a citrus scent, giving your home a clean fresh scent that lasts. Starting very small, Durvet’s eventual success in the healthcare industry is proof that passion in business surely means exceptional products and hence, loyal customers. Durvet, apart from its 20 independent shareholding distributors whose sales run in billions annually, makes a whopping $200 million from the sales of its animal health and care products per year, keeping pet owners happy and coming back for more with impressively performing products and the affordability they require. Used indoors to kill adult fleas, ticks, and even larvae, the No Bite IGR House & Carpet Spray is the Amazon’s Choice flea killing powder. One container should last approximately 3 months in a 1500 square foot home if you spray along baseboards, area rugs, furniture, and pet bedding, and it isn’t harmful to house plants. For the dog or cat lovers, this is a dream come true. Spraying on the dog bed after washing quickly gets rid of the fleas, ticks and literally all bugs. And the formulation of the powder is such that it reaches into hidden cracks and crevices, the eggs aren’t allowed to turn into insects, and the little ones stop growing; it’s a growth inhibiting hormone formulation. The effectiveness of the powder lasts for three months because of this. When other flea killing carpet powder can’t stop fleas from breeding in your couch and carpet, one application of No Bite takes away their pesky little lives and their power to bite. Seriously this is easily one of the best flea powder for carpets on the market. The smell may be horrible but only lasts a short while; a few hours tops. If you are in the market for something that works better than flea bombs, this should be just right. You just have to let it sit for a while after spraying so it gets the chance to work, vacuum every day and throw the bag away otherwise the fleas just crawl back out. You should also spray inside the vacuum for some added flea killer effect. Even if you don’t keep any pets, what do you do when guests come with flea-infested bags (even if you didn’t notice them then, that could well be the reason for your infestation weeks after they leave)? Thanks to Durvet, you don’t have to worry about that. Your granddaughter doesn’t have to say a teary goodbye to her little pup whenever she comes visiting you, and you don’t have to endure flea bites when she asks so nicely to bring him either! “Care for your pet, from nose to tail.” Bio-spot wants to help pet parents do just that because it believes that just like with the bond between a mother and child, a cat or dog is special to its owner, and deserves special care. Like a mother’s love, a pet’s love is unconditional so Bio-spot believes that the key to a happy home is a healthy, active, flea-free pet. Bio-spot’s famous 3-step key to preventing pest infestation is simple; protect, prevent, and defend. Using the specially formulated Bio Spot Active Care Powder, dog owners should protect pets from pests and prevent a new infestation so pests don’t hitch a ride into your home (and the effect lasts for as much as 3 months). Then using in hiding areas, defend your pets (and yourself) by eliminating ticks, fleas and other bugs. Because killing only the adult fleas and leaving the eggs and larvae lying around is merely scratching the problem at the surface, Bio-spot’s flea and tick carpet powder work to kill fleas in all four phases of the lifecycle so you can be sure that you have no live eggs, larvae, or pupae hanging around. If you proactively use the flea and tick powder Bio-spot guarantees that re-infestation will be kept under control for a full year. As far as the relatively non-toxic options go, this is one of the best flea powder for carpets you may find. All you need to do is apply it to the carpet, let sit for a while and then vacuum the carpet as you would normally. And this flea treatments will kill fleas on contact and leave no more fleas to bother you or your pets. The dust comes in handy with the purchase of a new home (don’t wait for the first bite before you treat) as sprays don’t really work well in scenarios like this. Leave it in before and vacuum before you move in and you can be sure you won’t see a flea. That said; also prepare for some real cleaning because things can get very dusty. Warning: wear a mask, especially if you have sensitive eyes or nose. Even though you may have to wash countertops and exposed surfaces using this powder because the dust gets everywhere, despair not. It only means that cracks and crevices have been thoroughly flushed too. Pest Peeves uses the power harnessed from nature to provide solutions that are both effective, and safe. Its products give all eco-friendly enthusiasts an alternative to the chemically laden pest control options littering the market. With this innovation, Pest Peeves has shown that it’s not just an effective pest control option but a mindful one too. Parents should be able to relax while their kids safely explore their world because it, frankly speaking, revolves around them. Pet owners should feel at ease as their beloved furry friends sniff around, unafraid of harmful chemicals lurking around. This is Pest Peeve’s philosophy and its goal, freeing your home of all nasties. Pest Peeve discovered that plants have always protected themselves in the face of pest invaders since a long time ago. Following this ‘aha’ moment, its people spent years carefully extracting, testing, and combining the pest repellent properties they discovered in plants. With all that creating and testing, its products have been developed such that even the worst of mulish bugs think twice! Its Pet Fleas Are History, for example, does just what its name says; makes fleas history. If you know a little bit about toxicity, you know that everyday repellents pose a dangerous risk to pets especially but since Fleas Are History is recommended by the world’s most holistic vets, it is safe to use for your cats and dogs and repels fleas and bugs. As for the ones too stubborn to simply leave, it sends them early to their tiny graves. This natural flea powder may have a secret ingredient because rather than wriggle and try to escape when you apply it on your pets, the just stand there and let it be put all over them, it’s almost as if it’s an enjoyable experience for them. When you put together its eco-friendliness, affordability, effectiveness, and this newly discovered secret, Fleas Are History becomes arguably one of the best flea powder for carpets. 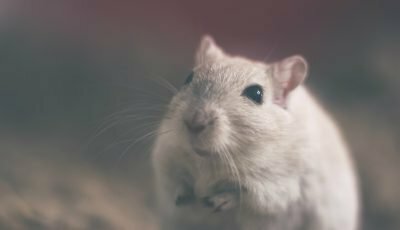 Pest Peeves is so confident about this product that all the vets worth visiting are raving about that a guarantee has even been attached to your purchase. Not happy with your results, just send the “Customer Happiness Team” a message and they’ll work it out. Think lawn, garden, and pets; think Central Garden & Pets. This company has been around since 1980 and hasn’t stopped hitting the public with innovative, quality service. Central’s brands have become recognized by consumers and even industry peers for this innovation. If you use Altosid mosquito problems control products, you already know you are in good hands with this Flea and Tick Powder. This wide range flea control powder helps keep your pets and home free from pests. It is known to control fleas, lice and tick. And with its pleasant smell, even outdoor cats won’t mind a little touching up with this powder. This means that you can put this on the dogs before you run them in the woods and rest assured that no ticks will hitch a ride home. Central really thought this product through. To make sure you have no difficulty dispensing the powder, Zodiac Flea and Tick Powder come with a shaker top (talk about innovation). The fast killing action means you never get to wait days for those pesky little buggers to stop biting you. Not only does it kill fast, it makes sure that the problem is kept at bay with its effects lasting a long long time. If you’ve ever fought a battle against fleas and lost, you know that while you are weary, exasperated, and tired of fighting the same battle all the time, you really can’t give up. Ever. 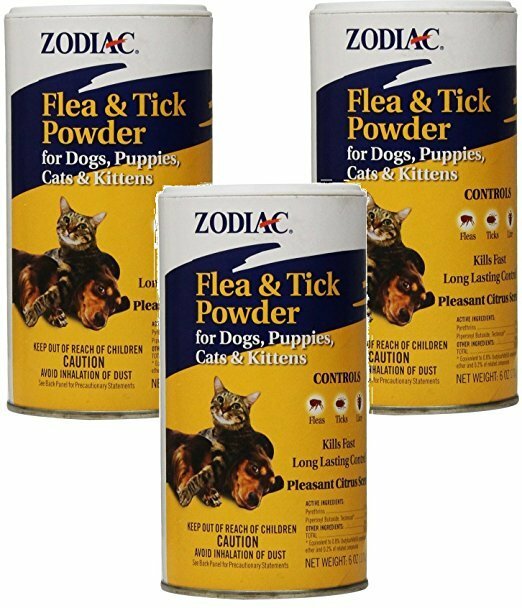 Zodiac Flea & Tick Powder, however, is guaranteed to make sure you don’t lose even if your fleas have become immune (easy with pets that come and go as they please). It may take a little time but there should be a difference between the first treatment and with the second one, they should be totally gone. From then on, it’s once a month for you and your cats. Interesting fact: Zodiac was determined by Second Chance Wildlife to be the gentlest way to treat fur-covered babies, ill, old animals. It works and it’s less toxic; so they said. Of course, you have to still apply it carefully; important to keep away from eyes, nose, and mouth; or any open/healing wounds but If there is a homeopathic product out there that is way less chemical and as effective, it apparently hasn’t been discovered yet. Since it pushed out its first successful product in 1977, Enforcer has developed well over 30 superior formulations that are designed to proffer professional solutions to pest control problems within homes and outside. Its extensive line of products includes insecticides for a broad range of pests and they are always available through renowned distributors, superstores, and groceries. Customers’ testimonials about its product have been one of its tools for increasing its customer base. What also makes this flea powder for home a must-have is that it is not selective when it comes to surfaces it can be used on. So, you are at liberty to apply it to different floor types, upholstered furniture, and carpets. It also offers 2 fragrances that eliminate odors in the home and replace them with a fresh and pleasant scent of the fragrances – Ocean Breeze and Fresh Linen. Using it is quite easy. All you need to do is sprinkle the powder lightly and evenly on target areas like your floor or carpet. Then allow it settle in for 30 minutes to get its job done before you vacuum. If you are trying to eradicate ticks instead, then you should allow it settle for 2 hours for productive results before you vacuum. When you buy a can of this flea powder, you get the opportunity to treat up to five 10 feet by 10 feet carpets. That’s a lot of flea killing goodness you get to enjoy from a single purchase. More so, it is a perfect choice for intermittent treatment of furniture, surfaces, and floors that your pests may be exposed to. 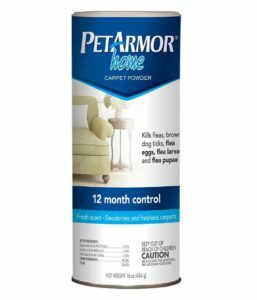 So, we think you should choose this pet carpet powder for a chance to enjoy your indoor space with your pets – away from the discomfort that fleas and other pests may cause. If nothing, let the itching and scratching end. Adams is a leading brand in the pet care industry that takes a smart and effective approach to pet care solutions. Its primary goal is to make protecting families and homes easier and even more effective. A good number of Adams’s products have been sold to many customers by veterinarians for well over 30 years and they include tick and flea topical products; collars and sprays for homes, dogs, cats, and puppies. In fact, you are likely to find just about any type of pet care product you want by shopping Adams’ range of products. A flea or tick infestation is probably one of the most annoying experiences you can have a home and/or a pet owner. And the search for the best flea powder is a kettle of fish on its own. This is why we have decided to take the pain to do a thorough research on Adams’s products and recommend its Flea and Tick Carpet Powder. This flea rug powder kills fleas at every single stage of the life cycle – from the eggs to the larvae to the pupae and adult stage. It also has the ability to break a cycle and leave a control and prevention effect that can last up to a year. This means that once you do a thorough application of this powder in target areas in your home and vacuum it, you won’t need to keep re-applying to get rid of the pests. Moreover, a 16-ounce can of this powder can treat areas that measure up to 200 to 400 square-feet effectively. So, if you have a larger space to cover, you may need to consider buying more than one can. It also has a fresh citrus scent that swallows up foul smells in the home while the active agents in it go on a killing spree. Its active ingredients include Nylar, which regulates insect growth and Linalool – an insecticide that is derived botanically. According to the manufacturers, this product is not safe for kids and pets. So, we advise you to apply caution while using it. Even though some pets don’t show allergic reactions to it, we prefer that you are safe rather than sorry. PetArmor is a subsidiary of one of the leading pet health companies in the industry, FidoPharm. Its products are usually made with quality and effective ingredients and are offered at pocket-friendly prices. They are distributed by a large crop of major retailers in the country so that consumers can enjoy the comfort and convenience of being able to access a pet care solution whenever the need arises. 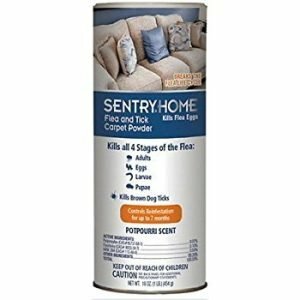 You should get its home carpet powder if you have been dealing with dog ticks and fleas for a while now. 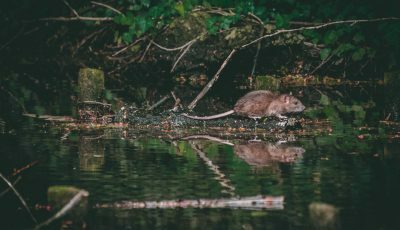 We know how frustrating it can be to have to try different products that do a poor job or virtually nothing at all in eradicating these pests. But with this powder, you are sure to give these pesky and irritating things a good run for their lives. Only that they actually run into their death. It is specially formulated to kill fleas at every stage in the cycle. So, it’s not just the adults that actually die, the eggs, pupae, and larvae also get destroyed with an application. It will also kill dog ticks effectively, especially the brown ones. And in cases where you have a not-so-good smell coming from your carpet, it deodorizes the carpet and gives it a clean and fresh scent. 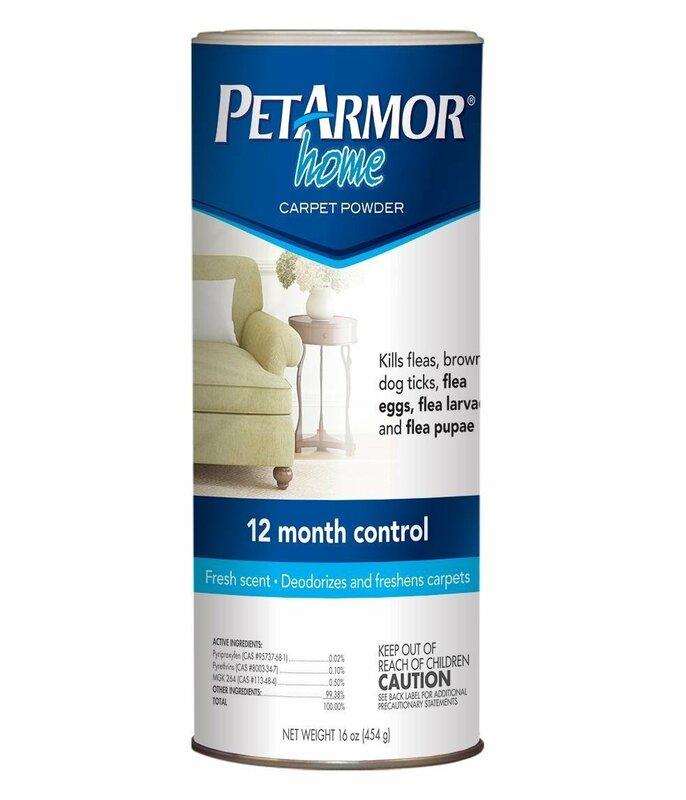 This 16-ounce can of freedom from fleas controls and prevents a re-infestation for a period of 365 days so that you don’t have to keep re-applying the powder to get rid of the fleas. Here’s something you should keep in mind: This rug powder is not kid-safe and should be kept out of children’s reach. Also, after applying it to your carpet, you’ll need to vacuum your rug. We advise you to do a thorough vacuum twice to remove the powder (certainly not its effectiveness) from your carpet. You should also keep your pets out of the room where you’ll be sprinkling the powder to avoid adverse effects on them. Sentry is an American company that is committed to manufacturing pet care products that improve the quality of life of pets and their owners. Being a renowned and trusted brand, it keeps setting high standards of excellence with its products. Little wonder, its customer base keeps getting larger. These products are effective, functional, pocket-friendly and easy to use. It currently boasts a team of pet care experts who work round the clock to ensure that their customers are constantly being served with products that meet their needs and demands. Its customer support team, for instance, consists a group of people who are committed to ensuring that every customer who makes a purchase of Sentry’s products has a good user experience. And in very rare cases where a customer is displeased with a product, they give their unreserved help to ensure that he or she eventually smiles. For the best flea powder on the market, look no further than the Sentry Flea and Tick Carpet Powder. This flea powder for house pest control comes in a 16-ounce can and can kill fleas at every stage of the life cycle. That is the eggs, pupae, larvae, and adult fleas are wiped out in a single application. And not only that, it kills brown dog ticks that get your canines itchy and scratchy all over. Now, sometimes these pesky creatures may fall off your pets and crawl up to hidden corners of your home where you can’t see them easily. This is why we recommend a thorough application. And to do that this product is not one that will cause damage to your surfaces. This is one thing you shouldn’t be worried about. So you can safely apply it on any surface in your home where the fleas are likely to be or in areas where your pets are sure to go to in your home. 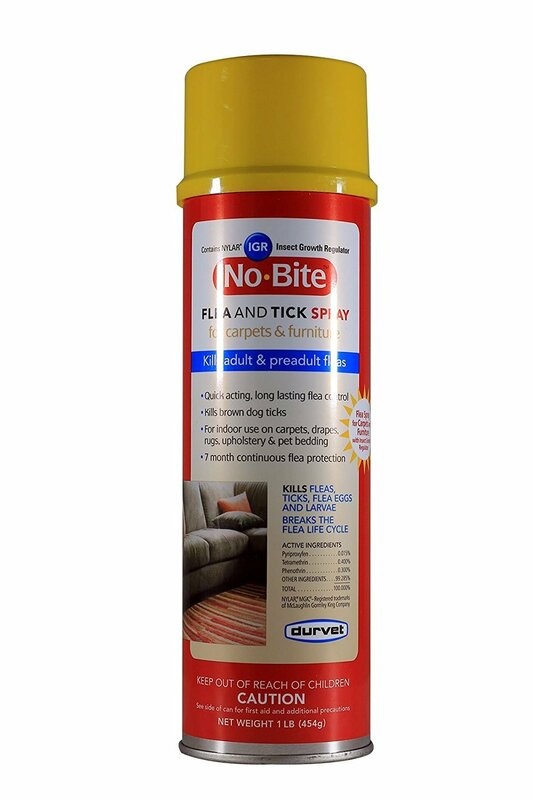 After a single application, it retains its ability to control and prevent further infestation – keeping your home free of flea and brown dog tick-flea for close to 7 months. This means you won’t have to keep re-applying the powder with frequent infestations. What exactly are we saying? Well, if you wish to protect your home, family, and pets from the itching and scratching you have noticed lately or the one you want to prevent, then choose this flea rug powder. This will prevent sicknesses and diseases that are easily transmitted by ticks and fleas. Meanwhile, we strongly advise that you keep your pets and kids out of the room when you are applying this powder and they should not be found playing with or around it. Once you have applied it to your carpets, you can then do a good vacuuming to take off the layer of white that would have settled on your surfaces and furniture. Now you know how to you can effectively boot those fleas out of your home using some of the most effective flea carpet powders on the market. We are pretty sure our guide was able to enlighten you on a thing or two you might not have known about flea control before. Armed with this information, go ahead and get that flea powder and give yourself a flea-free home. You deserve it!